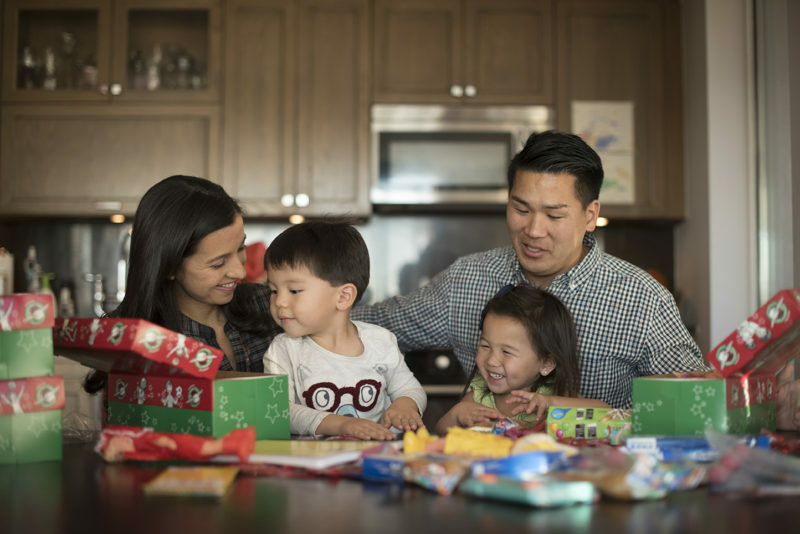 Pack shoebox gifts as a family and double your impact. Teach your children about caring for others as your family extends God’s love to a boy or girl in need. We often talk about the importance of parents living out their faith in front of their children. We at Samaritan’s Purse also see the roles reversed. Our church partners around the world are teaching children to live out their newfound faith to their friends and family members. Operation Christmas Child has collected and delivered more than 135 million gift-filled shoeboxes to children in more than 100 countries since 1993. During shoebox distributions, local churches present a Gospel message about how Jesus is The Greatest Gift the children could ever receive. Then, they invite the children to a 12-lesson discipleship course called The Greatest Journey. Sometimes, the children’s expressions of faith are met with encouragement from their family members. For Luciana, it meant her parents reading with her from the Gospel booklet she had received at an Operation Christmas Child outreach event where she had become the first one in her family to decide to follow Jesus. Other times when children share about Jesus with their parents, they are discouraged from or even punished for believing something different than their family, community, or culture. For Azima, it meant not being able to go to church unless the 14-year-old snuck out of her house with her sisters to go with her aunt. Her father went from actively opposing them to ignoring the situation until one day, he called the family together. Azima thought they would get in trouble for having gone to church again, but, standing in front of a Bible, he asked them to pray with him. He wanted to accept Jesus as Lord. This family now can worship the Lord together and reach other families in His Name. One of the best ways you can teach your child the importance of sharing the Gospel is to do that together. While preparing Operation Christmas Child shoeboxes as a family, you can pray together for the families whose homes those shoeboxes will enter with the message of the Gospel. You can talk about how believers in Christ are sharing this message in their communities and how we are called by God to do the same. Thank God for how He is working in the life of your family. Talk with your child about how important it is to share the message of Jesus with others, especially with those who haven’t heard about Him. Explore additional ways that you and your family can share about Jesus in your community. Decide how many shoebox gifts you will fill. We ask that each shoebox contains a “wow” toy, as well as a selection of school supplies, hygiene items, personal items such as clothing or accessories, and activity items. We also request that you make a $7 donation per box to cover shipping. Is this something your children could help pay for, by doing chores or setting aside part of an allowance? You can include handmade items that you and your child have created. We have gift suggestions according to gender and age group that you can review. If you prefer to purchase the gifts, encourage your children to select gift items they think other children would like. Some people prefer to follow a theme, such as buying items of similar color. If your aim is to go gift shopping in one trip, consider making it a race among your family members. Can you fill a box—within budget—in 10 minutes or less? Write a note and include a photo of your family in your shoebox. A photo transcends language differences and puts a face to the gift. Your kids can fill out our “Let’s Be Friends” coloring pages as another way to personalize the gift. Teach your kids about why the $7 donation for shipping and program costs is needed. Explore how much it would cost to send a package to another country by locating an international postage calculator online. Identify different countries on a map and calculate the distance from you. Sometimes shoeboxes travel by sea as well as by air and make several legs of a journey to remote locations via vehicles, boats, and even on the backs of elephants and camels! Pray before, during, and after packing your shoeboxes. Pray for smooth passage of the shoeboxes to their destinations. Pray for the local churches who will distribute these shoeboxes, as well as for the children who will receive them. Ask God to use your gift to open doors for the Gospel with their families. By giving the $7 per box shipping donation online through Follow Your Box, you can find out in which country each box was delivered. Explore the cultures and customs of that country, praying for its inhabitants to hear and receive the Gospel. If you wrap the shoeboxes, wrap the lid separately from the rest of the box. Place a rubber band around each shoebox and take it to the nearest drop-off location during National Shoebox Collection Week, November 14-21. If your child is at least 13 years old, he or she can volunteer alongside you at a processing center to help prepare shoeboxes for shipment. When you prepare shoeboxes, you are showing God’s love to a child and family overseas. Operation Christmas Child is a project of Samaritan’s Purse, an international Christian relief and evangelism organization headed by Franklin Graham. The mission of Operation Christmas Child is to demonstrate God’s love in a tangible way to children in need around the world and, together with local churches worldwide, to share the Good News of Jesus Christ.